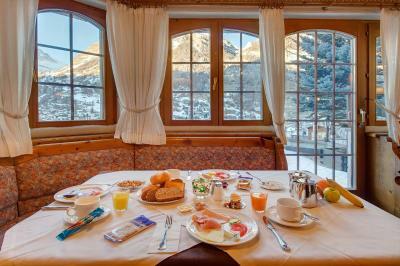 Lock in a great price for Hotel Alpenroyal – rated 8.7 by recent guests! Loved the view of the Matterhorn from our room. I booked this hotel because I wanted a view. It did not disappoint. The room was comfortable and had a deck. A taxi met us at the train station and took us up the hill free of charge. We called from a courtesy phone at the station. Breakfast was good. The alpine feel was charming. No elevator to our room but we managed. wwonderful stay， it had a short cut to go to train station. Amazing view from the room. Excellent location at the foot of the ski slope and easy access to the town center with the elevator and underground tunnel. Modern Sauna. The view is out of this world, the thing I liked most was that the hotel is out of the beaten path so we saw more people who lived in town and the area was very quiet and peaceful. LOVED this location! It sits above the village a bit and the view from the balcony is incredible! The property shares an elevator with the hotel next door - best entrance to a hotel ever!! You go through a tunnel that is softly lit, and with nice music playing - so cool! The beds were super comfortable, the staff was EXCELLENT, and breakfast was amazing. I will definitely stay here again! Excellent location with nice view of the Matterhorn . Wonderful host Monica. Hotel Alpenroyal This rating is a reflection of how the property compares to the industry standard when it comes to price, facilities and services available. It's based on a self-evaluation by the property. Use this rating to help choose your stay! One of our top picks in Zermatt.The Alpenroyal Hotel features panoramic Matterhorn views from its quiet location in car-free Zermatt. You enjoy free access to the indoor swimming pool, the hot tub, the sauna and the steam bath. All rooms have a private bathroom and a cable TV. Tasty Swiss food is served in the restaurant. 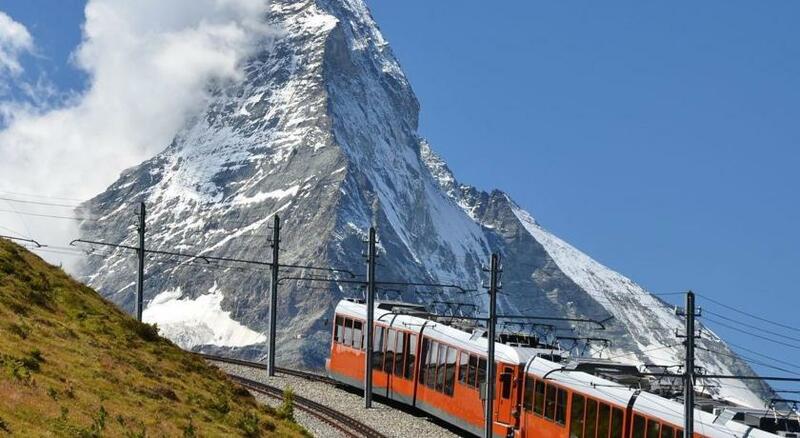 Hotel Alpenroyal is right at the end of the Rothorn ski run, 5 minutes from the Sunnegga valley station (via a lift) and 7 minutes from the Gornergrat train station (by bus). The village center can be reached within 3 minutes by a lift. When would you like to stay at Hotel Alpenroyal? This room features a TV and a bathroom with a hairdryer. Room with Matterhorn views, a balcony or terrace, a TV, a safe, and a bathroom with a hairdryer. 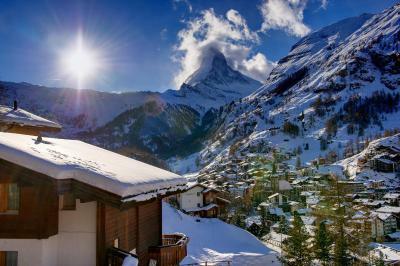 Room with Matterhorn views, a balcony or terrace, a TV, a safe, a sofa bed, and a bathroom with a hairdryer. Some of the rooms are in the attic and have sloping ceilings. Room with views of the Matterhorn, a balcony or terrace, a TV, a safe, and a bathroom with a hairdryer. Some of the rooms are in the attic and have sloping ceilings. Family room with Matterhorn view, balcony or terrace, 1 twin room, 1 single room, sitting area, bath/toilet, toilet, hairdryer, TV and safe. Single room with shower/toilet, hairdryer, TV and safe. House Rules Hotel Alpenroyal takes special requests – add in the next step! Hotel Alpenroyal accepts these cards and reserves the right to temporarily hold an amount prior to arrival. Please note that Zermatt is a car-free village. 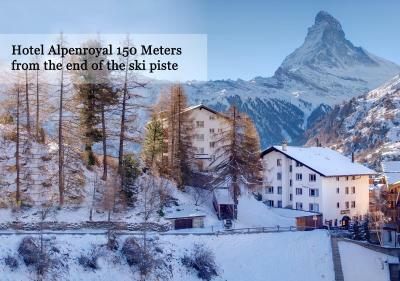 You can park your car in Täsch (indoor parking) and continue to Zermatt by train or taxi. A shuttle service from the parking area or from the train station can be provided upon request by the hotel between 8 am and 5 pm and against a surcharge. We arranged a hotel transportation to train station 6:00 AM but never showed up. You better call a taxi yourself if you need to catch early train. They don’t have 24 hrs front desk! Fabulous view, excellent service, nice location, very good breakfast. Very good quality, will be coming back. great breakfast. 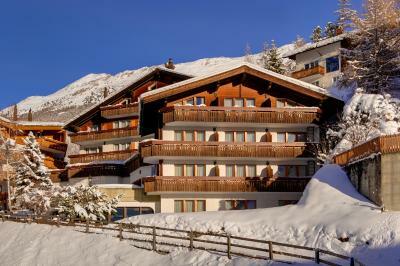 great Wellness spa with steam room/sauna/hot tub and indoor pool with superb view of the Matterhorn. Staff very considerate and friendly. No amenities in the bathroom. Also no hotpot to make coffee or tea. The room where ski boots are to be left is quite small and it is hard to use for changing of boots for more than 2 persons at a time. This room is also used by personnel going in and out of the back door. The staff is very helpful. They actually care. It was excellent and varied.